Open Bionics has unveiled a line of 3D printed prosthetics designed for kids that are fashioned after popular Disney characters. 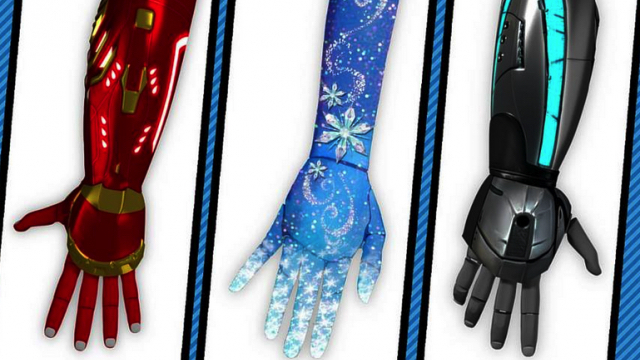 Starting in 2016, kids will be able to choose from Iron Man's tech armor, Queen Elsa's sparkling glove, and a Star Wars lightsaber themed model all priced at about $500. It joined the 2015 Disney Accelerator programme, through which the company has donated "the time of its creative teams and provided royalty free licenses" for the three character arms. All three models feature LED lighting that fit the themes and the Iron Man's arm includes a vibration motor for simulated rocket fire action. One-year old startup Open Bionics – which was a finalist in Intel's 2014 Make It Wearable competition – makes affordable 3D-printed robotic prosthetics for those with limb differences. The benefits of affordable 3D printed bionic limbs is especially good for children born without hands. At present the cost of prosthetics means that as children grow many will be left with out-grown limbs. The low cost, modular nature of Open Bionics' prosthetics helps solve this problem, and by partnering with Disney, it means kids can feel excited and empowered by their prosthetics.